It was visits to his Uncle Al that started San Antonio potter Jack Boyle on the path to clay. What Boyle didn’t appreciate at the time was that Uncle Al owned Jugtown Pottery in Seagrove, North Carolina, a pottery community with roots going back at least 200 years. Then Uncle Al sold the shop and the visits stopped. A decade or so later, Boyle, born in St. Petersburg and a graduate of Lakewood High School, enrolled in the University of South Florida as an art major. “I walked into the studio at USF, and the smell of the clay and the atmosphere in the studio brought those visits back,” Boyle said. Boyle graduated in 1977 with a degree in art and a concentration in ceramics. He thought he would head south to the Ellenton area. But a friend of his knew someone selling a wheel and kiln and other equipment. He also had space to lease at a price Boyle couldn’t refuse. There was one small problem. San Antonio, in a rural part of Pasco County—Boyle’s shop looks out on a hay field across the road—isn’t exactly teeming with potential customers. Boyle had to find ways to connect with a larger customer base. “I did everything I could think of and never turned down an opportunity,” Boyle said. “Everything” meant a grueling schedule of art and craft festivals, pitching his work to galleries across the country, selling work in his own shop, and teaching classes. More recently, he has begun producing videos featuring artists around the country. Boyle and his wife, Deborah Gillars, a recently retired high school art teacher, raised three children and put them through college. They built a home and kept adding to their shop. Boyle has created hundreds of thousands of mugs, bowls, and other functional stoneware pieces in his almost forty-year career. His work is rustic and earthy. What appears to be a small tree branch forms a pouring handle curved above a footed teapot glazed in river-blue and loam-brown. Bowls glazed in shades of dark coffee, cobalt and cream feature designs carved into the rims, dark lines evoking rolling foothills or the waves of a wind-rippled field of grass. Browns and blues and greens flow over vases’ carved bellies like streams over stones, inviting the hand as well as the eye to explore the surfaces. But Boyle’s work isn’t just that of an artist. And some of his most important tools aren’t his wheel or kiln. Boyle begins most pieces with a tape measure, a calculator, and calipers. His customers expect pieces of specific dimensions, so he measures the height, the width at the belly, and other spots of a finished model piece, using the metric side of his tape “because the system makes more sense,” Boyle explained. “Then I add a percentage to the measurements to allow for shrinkage in the kiln,” Boyle said, tapping the keys of the calculator. As he forms the new piece on the wheel, Boyle takes periodic measurements to be sure he is staying true to the model. Other important tools are the gauges controlling the flow of propane into his gas-fired kiln and the pyrometer that tells him how hot the temperature is inside the kiln. “Space Saucer,” a tribute to curiosity and discovery. “I always fire my pieces to at least 2300 degrees,” Boyle said, adding that doesn’t use lead or other toxins in his glazes. Boyle’s gas kiln sits on his back porch and is so big the racks are built on a trolley that slides in and out of the kiln on metal tracks. Each time he checks the temperature in the kiln, Boyle records the information in a notebook. Later he reads through his notebooks. 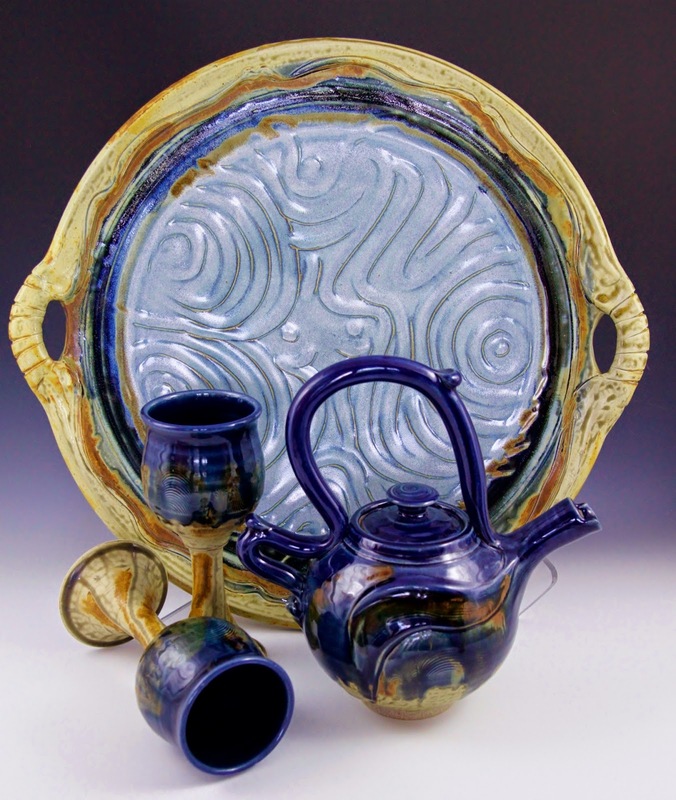 Boyle estimates he has produced hundreds of thousands of mugs, trays, bowls, vases, and other functional art over the almost forty years he has worked as a potter. Recently, however, he has begun producing a more conceptual line of work. fuels his thinking during15-mile morning bike rides. 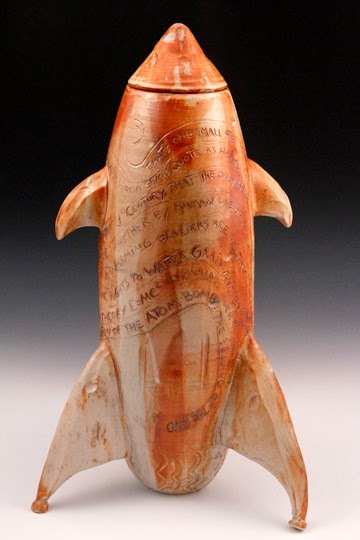 Many of the pieces in the series are shaped like rockets or saucers and feature Boyle’s musings about the universe, gleaned from his “voracious” reading habit and often surfacing during his 15-mile bike rides each morning on the back roads near San Antonio. 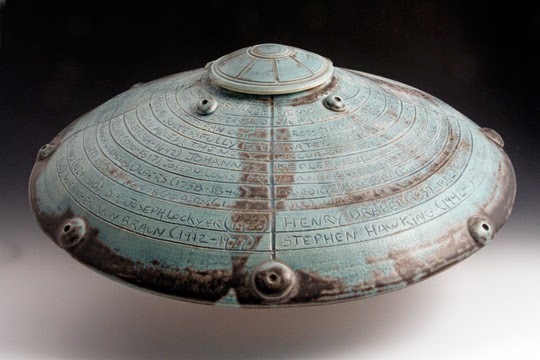 One saucer-shaped piece features the names of various scientists through history, along with the years each lived on earth. Boyle is fascinated by the ancient geoglyphs—massive images carved into the surface of the earth and visible only from the air—found around the world. One of those images, a 150-foot long spider that is part of the Peruvian Nazca line glyphs, appears in miniature form on one of Boyle’s rocket ships along with carved prose and the latitude and longitude of the glyph. “Don’t you just wonder if those geoglyphs aren’t part of some sort of intergalactic scavenger hunt?” Boyle asked, his eyes twinkling at the idea. Tour-goers following the south-to-north route will find Jack Boyle’s San Antonio Pottery studio listed as the last stop. Guest artists Michele Ginouves, Hil-Dee Bates, Maggie Clark, Barbara Ott, and Joel Ott will display their work throughout the shop, and Jack will open his large kiln out back around 5 p.m. Join the party, too—there will be music, an antique Coke cooler with beverages, and lots of festivity.